Adjustable middle shelf is standard - adjustable on 3-1/2” centers - see options for additional shelves. Durable 12 gauge steel shelves, and 3/16” thick angle corners. 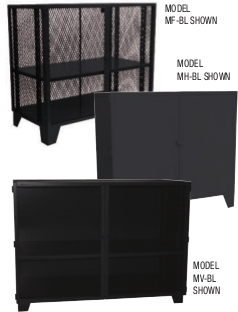 Powder coated black finish (see options). Sides and back flattened 13 gauge expanded mesh 4’ high (also top cover).